Mix batter ingredients in a pre-sprayed 9-1/2-inch deep dish pie plate. Spread pizza sauce evenly over batter. Top dough with pepperoni slices. Sprinkle with cheese. 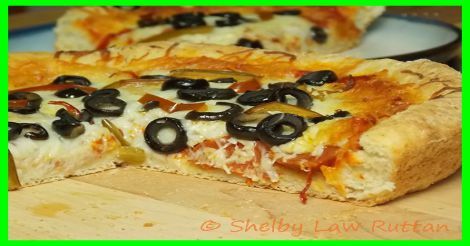 Top with olives and medium hot pepper slices.Bake by placing in a cold oven; set temperature to 350 degrees F. Bake for 30 minutes or until done.